Subject to Sony Entertainment Network Terms of Service. Click here for details. This lets you control the camera with a smartphone. You’ll find it a great help for group photos when the camera is mounted on a tripod. 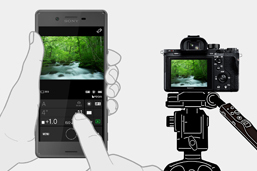 You can control exposure and shutter release — all from your smartphone! And for added convenience, photos shot using the application will be automatically sent to your smartphone for on-the-spot sharing. Easily connect to the camera via Wi-Fi by scanning a QR code. Some functions of the camera are not supported by this application. The application has its own settings for some items such as ISO Sensitivity and Shutter Speed. Refer to (Specifications) and (FAQs) for details. 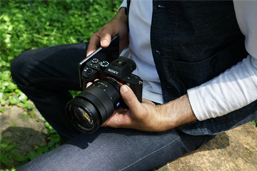 Use of this product is subject to the Sony Entertainment Network Terms of Service and the PlayMemories Camera Apps Application Terms and Conditions, reviewable through the links at the bottom of this page. Installation will start after you click “Install”. - Easily connect to the camera via Wi-Fi by scanning a QR code. * Not available on some models. Refer to "Specifications" for details. One or more additional camera models are now supported. * Except for DSC-HX400V, DSC-HX400. *Not available on some models. Please see the Specifications page for details.